R-50 requires just 1.5” to match the R-value of 10-15” of traditional insulation. Imagine the possibilities… and watch our video for details. Ready to talk about your commercial project? Thank you! We will reach out on the day you requested and look forward to learning more and sharing about our product. Rich-E-Board™ — an innovative insulated composite panel (ICP) system that delivers superior performance. Two polyisocyanurate foam cover boards sandwich a proprietary Vacuum Insulated Panel (VIP) – a patented design that delivers unmatched value in new roof construction – and eliminates the headaches and high costs typically associated with retrofitted roofs. Today, Rich-E-Board is a key component of Sika’s Sarnathin-50 system. 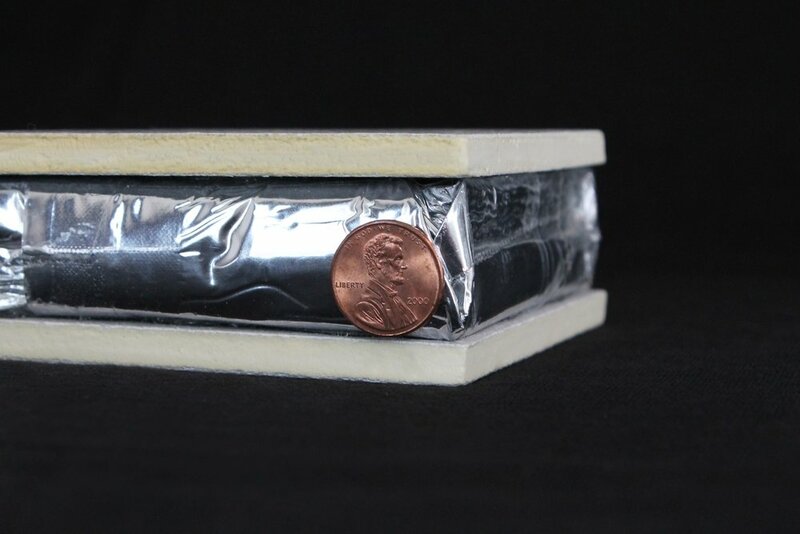 Vacuum Insulated Panels (VIPs) — a compact, insulated panel that employs a high-performance fiberglass core, vacuum sealed in a reinforced polyester barrier. Rich-E-Board’s thin profile gives architects, designers and consultants an innovative alternative for designing or retrofitting a roof. The benefit: you achieve mandated R-values without costly and destructive building modifications. With R-50, you’ll meet or exceed stringent codes — without raising the roof to accommodate traditional insulation. Increasing a building’s R-value to R-50 can reduce electric bills by up to 8% and natural gas costs by 10% — a significant savings over a building’s lifetime..
R-50 Systems products are cut-to-spec and lightweight, lowering the cost of delivery and handling and reducing labor costs — both to and on the jobsite. Conventional insulation requires 10- 15” of height to reach the required R-value, making it extremely costly when retrofitting buildings. R-50 Systems products meet or exceed those R-value requirements with a thickness of 1.5” or less. The advantage: you avoid the expense, noise, dust and displacement associated with an extensive renovation. Rich-E-Board is recyclable and reusable, achieving LEED 4.0 Recyclable Content approval, and because the panels are manufactured to specifications, they generate far less waste than standard insulation. Working toward a net-zero building? R-50 Insulation Systems is part of the solution. R-50 products are resistant to water and mold, offering outstanding compressive strength, and carry a Class A fire rating — huge advantages over conventional insulation. With an incredibly slim profile — especially compared with multi-layer conventional insulation — Rich-E-Board saves space and expands the design universe. Because Rich-E-Board can be produced to various dimensions, it can be used in most building and wall applications. Rich-E-Board is patented and consists of three main components: the proprietary Vacuum Insulated Panel (VIP), two polyisocyanurate foam cover boards that protect the panel, and the adhesive ribbons that bind the boards and panel together. The result: unparalleled performance in the field.